If I had to limit myself forever more to a single vegetable, I could first cry out at the injustice of it all, and then grudgingly pick cabbage. I know of no crop more versatile, delicious, adaptable and healthy. This recipe showcases cabbage’s comfort-food side. Slow braised with onions and cream, it ends up sweet and tender and perfect as a simple winter side dish. Planning on a St. Patrick’s Day dinner next week? Try this cabbage alongside the ubiquitous corned beef. You won’t be disappointed. Click here for the printable recipe, or follow along for the step-by-step visual instructions. Clean up your cabbage and get rid of any ugly outer leaves. Cut your cabbage into wedges, leaving the core intact so the wedges stay together. Get out a big baking dish and rub it with butter, then line your cabbages wedges up like little brassica soldiers in there. Keep everything in a single layer as much as you can. Pour a half-cup of heavy cream over the veggies and you’re nearly there. If you want a lower fat side, you can use chicken or veg stock for the liquid, too. It won’t be the same but it will still be delicious. Cover with foil and stick the veggies in a 325-degree oven to braise for about two hours, turning the cabbage wedges over once during cooking. When the cabbage and onions are totally tender, remove the foil from the dish and crank the oven up to 400. 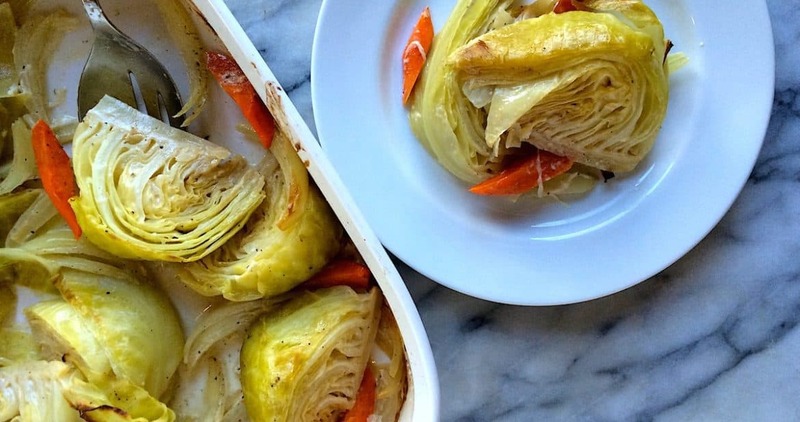 Let the cabbage roast until it’s brown and caramelized a bit. Taste your cabbage and add a bit more salt and pepper if the dish needs it, then serve all the veggies in a delicious tangled mass. Adjust the oven rack to the lower-middle position and preheat the oven to 325 degrees. Lightly grease the inside of a large, 9x13 baking dish with butter. Trim the cabbage of any ugly outer leaves, then cut the cabbages into 8 to 12 wedges, depending on the size of the cabbage. 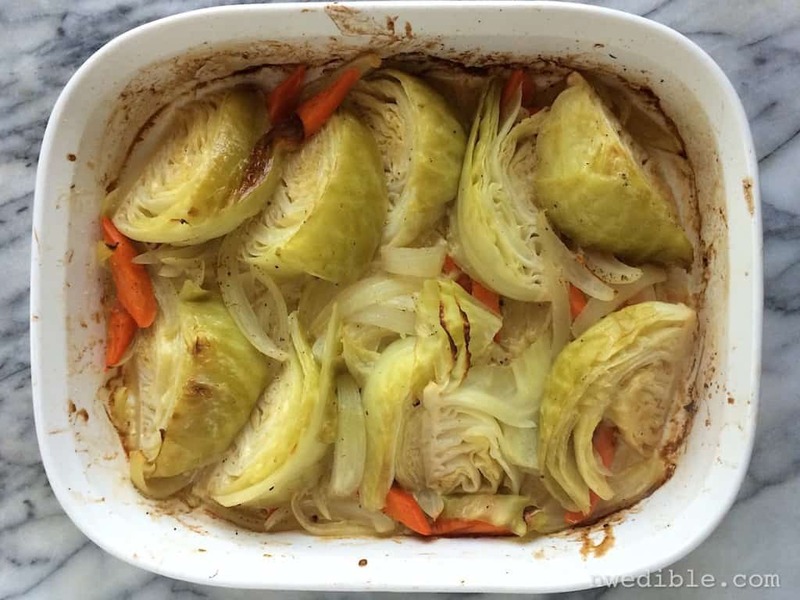 Leave the core of the cabbage intact so the cabbage wedges stay together. 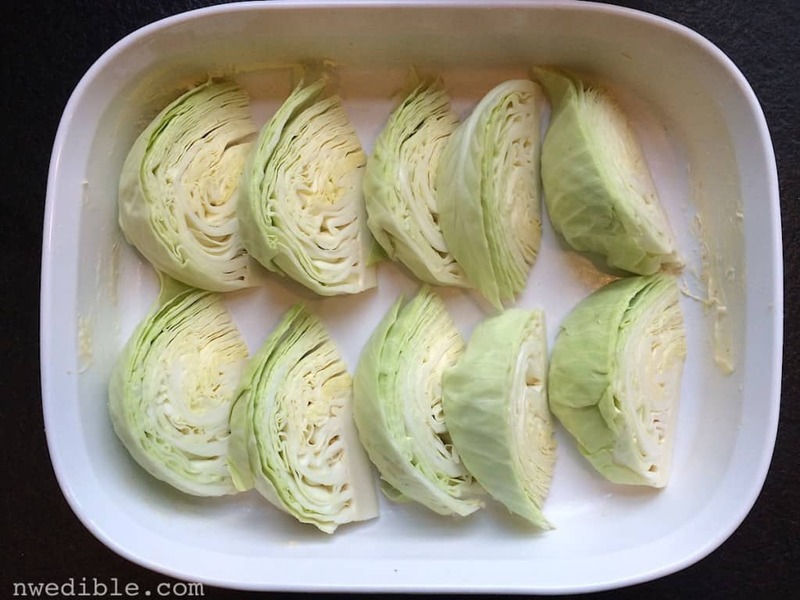 Arrange the cabbage wedges in a single layer in the baking dish. Peel, trim and thickly slice the onion and carrot. Scatter the onion and the carrot over the cabbage wedges. Generously season the vegetables with salt, pepper and freshly ground nutmeg. Pour the heavy cream over the vegetables, then cover the baking dish with foil and pop the whole thing in the oven for an hour. 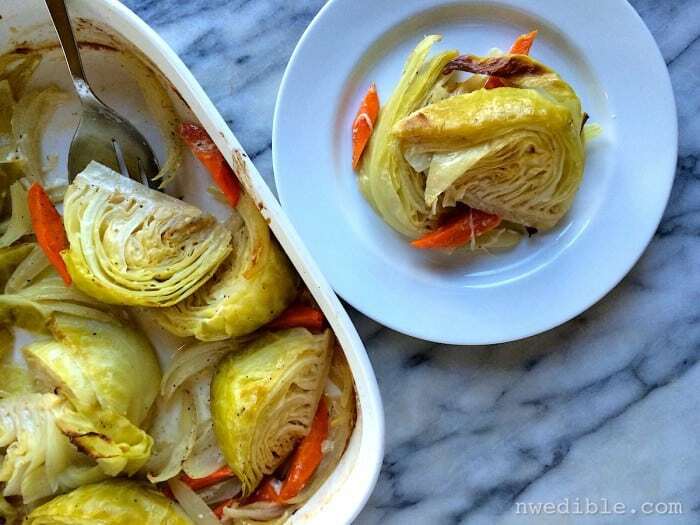 After an hour, pull the baking dish from the oven and flip the cabbage wedges over. Then, recover the dish with foil and stick it back in the oven for another hour. After two total hours of braising time, check the tenderness of the vegetables. The cabbage wedges, including the core, should be completely tender. The onion should be fully translucent and tender. If the vegetables are not totally tender, re-cover the pan and return it to the oven for another 20 to 30 minutes. 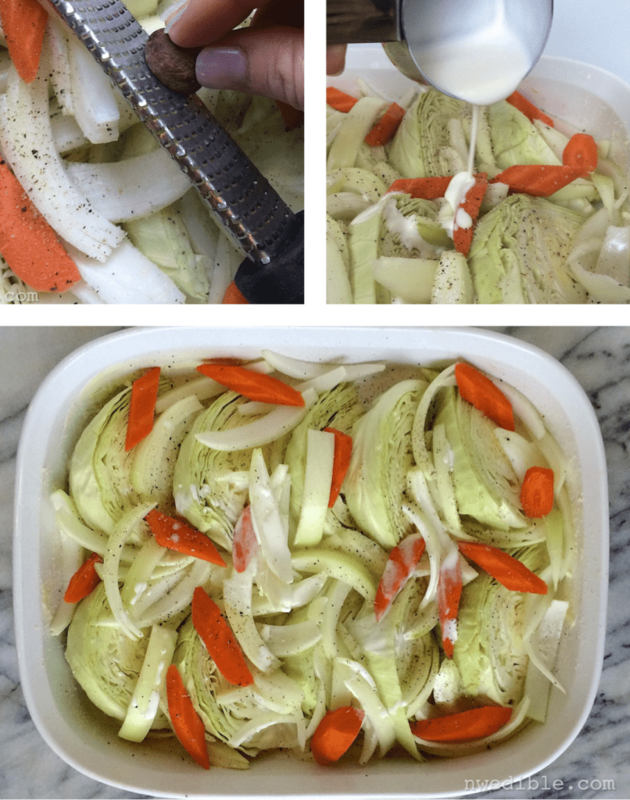 When the vegetables are totally tender, remove the foil from the baking dish and jack the oven up to 400 degrees. Let the vegetables cook at this higher temperature for about 25 minutes, until they begin to brown and the creamy-sauce thickens to coat the vegetables. To serve, adjust seasoning with another sprinkle of salt and pepper, then spoon 2 wedges of cabbage and a generous portion of onions, carrots and sauce onto a plate. Oh, that looks delicious, easy, and indeed comforting. We will have to try that soon! Holy Moly, that sounds so good. I sometimes wonder why I didn’t like cruciferous vegetables when I was young, they’re so delicious! I know! I’m lucky that my kids are mostly okay with the cole-crops, because I love them. I’ll have to try this with cream next time. I like that yours is very hands-off. I make a similar one on the stove top, but I shred my cabbage so it cooks quicker and add lemon juice to help balance the fat of the cream. Sounds lovely. Should you ever find yourself with pine nuts, sauteed shredded cabbage with lemon and pinenuts is delicious, too. Add a slice of ham and bing, boom, bam dinner is served. Lovely recipe Erica and for us dairy problem folks I would recommend subbing 1/2 stock and 1/2 cashew milk instead of cream. Great tip, thanks! I’m made cashew ricotta before and I was SHOCKED at how delicious it was. Hmmm. I have a head of cabbage at home, and now I know what I’m going to do with it! Darnit though, I don’t think I’m going to have the 2 hours for it by the time I get home from work tonight, and it would have been great with what’s already in the crockpot. Of course, since no one else in the family will eat cabbage, maybe I’ll just make it up for leftovers for the rest of the week. This will reheat very well, for sure. I can’t wait to try it! Thanks for the inspiration to try harder to successfully grow cabbage. It took me a long time to get cabbage right in my garden, even though it’s a supposedly “easy” crop. I remember my first homegrown cabbage. It was heaven. Keep trying, you’ll get there! Do you think this would work with red cabbage? We have two HUGE heads in the fridge from our last CSA delivery of the winter and I can’t think of much else to do with them. We can only eat so much coleslaw in this house. I wouldn’t braise red cabbage in cream. I think it would end up funny looking and drab. I like to shred red cabbage, then cook it in a skillet with balsamic vinegar. Do you think this could be done in a crockpot? Yes I think so, although you might not get the same caramelization from the high-heat blast at the end. Hi Erica, I love and trust your recipes. I’m going to try this out using a bunch of brussel sprouts. As for the red cabbage I braise it with chicken stock, onion, garlic and caraway seeds, salt and pepper, and then finish it with a splash of red wine vinegar and cook for another 5 minutes. Holy moley this was delicious! I made it tonight, following the recipe, and it was a perfect side for corned beef…or main course with a corned beef side. I’m definitely making it again. Thank you for another great recipe! I made this over the weekend to go with corned beef and it was amazing! Thank you so much for the recipe! I made this last night, using half stock and half cream…so very delicious. My husband said it was even better the second day. Thanks for the wonderful recipe! I usually stirfry cabbage and onions to go with corned beef, but saw your recipe and thought ‘why not?’…what a lovely accompaniment to the corned beef – really delicious and I will be making this again!